Did you ever think about trading in the old truck or Sport Utility Vehicle (SUV) for a new fuel efficient hybrid vehicle? They do sip the gas but they don't always meet the other needs we have - for carrying capacity, towing, or go-anywhere four wheel drive. But - I can make my 20 mpg SUV sip fuel (per week) like a 50 mpg Hybrid if I park it and ride my bicycle just three days a week! But riding is hard work, you get all sweaty, the hills are high, and it just isn't fun for many people. There is a solution and it is available right NOW! By adding an electric kit to your bike, or buying a new already-electrified E-bike we can get the best of both worlds - save fuel, get some exercise, and have fun doing it! No more parking hassle either!! Plus it is about twice as fast as taking the bus, and about the same speed as driving in city traffic. Batteries and motors have reached a level where they can have enough range and power to make most commutes easily. My commute is 13 miles one way and has 1,200 feet of climbing. This takes less than 500 watt-hours from my battery pack, and it charges in a few hours at work using a few pennies of juice so it is full for the home trip. Above is my first electric bike, a standard aluminum mountain bike from REI that I already owned and then later outfitted with a hubmotor kit in the rear wheel and a battery mounted forward in the triangle. Shown with the battery cover removed. The trunk in the rear is completely available for luggage and it has fold-out panniers to carry extra stuff. It has a front suspension and a suspension seat post to take the sting out of the bumps in the road, and the large tires also help absorb them. If the batteries run low I still have plenty of gears to pedal with, too. The cost of electric bikes varies from under five hundred bucks for barely useable stuff to many thousands for top of the line gear. But you can get a very useful ebike setup for one to three thousand which is a whole lot less than the 30-40K of a new Prius, Leaf or Volt. These bikes are fun to drive, too. Legally they can use electric power up to 20 mph, so you won't beat out the serious road bike riders until you get to a hill. Then you can smoke right by them at 15 or 20 mph while they crank up the hill the hard way. Be nice to them though, they may help you sometime if you need a tool alongside the road. We're all in this together. My commute takes about a half hour in the car, unless traffic extends that. On the bike it takes about 40 minutes. But I get a nice bit of exercise without getting so much to make me sweaty, unless I want to. On the way home I can get as sweaty as I choose. And it saves me the time and fuel of going to the gym. Heck it is a lot cheaper to have an ebike and skip the gym membership. Think of all the CO2 produced driving to the gym! I arrive at my destination refreshed and ready to focus. I can't do it every day but my goal is to average 3 days a week. I won't ride in the rain or bad weather, or when I need to carry too much stuff, give someone a ride or come home very late. Still it can make a lot of commute runs, and it saves me about five bucks in gas alone each time I ride, and almost 30 pounds of CO2. My SUV will last many years longer and they won't have to consume all the materials and fuels to make me a greener vehicle just yet. Over the long haul it is a huge savings! AND if you decide to go ahead and get that 50 mpg Hybrid, you can still ride your ebike and raise the effective mileage to 125 mpg! I decided to try something a bit more comfortable and efficient for those longer weekend rides, and a suitable recumbent bikeE was available on Craig's list so I snapped it up. This conversion is not complete, but it easily makes the commute run. The rear wheel contains a geared hubmotor and the batteries are along the main support both above and below. This bike rolls so efficiently that it catches the road bikes on the downhills! It is like riding your lawn chair down the road, except for the bumps. The fat tires soak some of that up, but there is no suspension on this particular bikeE. This bike is quite lightweight, you could pedal it a long way if you ran out of battery, but it sips less battery than most ebikes so you have a lot of range. For my next ebike project I wanted to get a frame that was designed to hold batteries. It is a world bike - parts came from all over the world, thanks to the power of the internet. This bike also has front and rear suspension for a cushy comfortable ride. I put tough moped tires and rims on so it can handle potholes and road debris without problems. With the larger battery pack onboard it is heavier and not really something you want to pedal very far without the motor. This is a commuter, designed for high reliability and stability. It may not the easiest thing to pedal without the motor, but it is a BLAST to pilot. I still pedal along a lot of the time, and get a great workout. This is a commuter's dream. The larger battery makes it possible to commute to work and return home without needing to charge at work (or I could charge it ONLY at work and save a few cents of electricity at home). The big tires and dual suspension eat up the bad roads. There are lots of kits and ready-made E-bikes on the market these days. Folding e-bikes, motorized mountain bikes, electric assisted road bikes and heavy cargo carrying electric bicycles. Something for just about every need! So what is next for me? Lots of little projects to finish up on these three ebikes. A paint job, for one, and a kickstand for another. 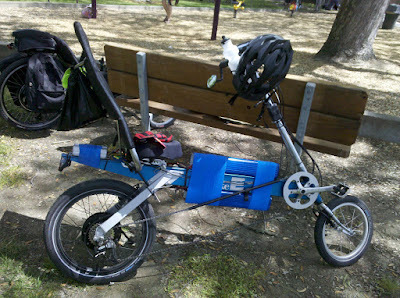 I'm already working on setting up my Ham Radio on the ebike. That will give me something to listen to. I don't sell these kits or ebikes, check with your local bike store. If they don't have ebike expertise (and many don't, shame on them) look to a local ebike store or the internet. Be careful, there is some not so good stuff out there, but there are also some excellent products. Just say no to lead batteries, by the way. Lithium is the answer.